This is a great juice to make as it requires only 2 ingredients. I don’t know about you, but my juices typically consist of anywhere from 6-8 different fruits and veggies. I love variety and incorporating as many different ingredients, which means I get more bang for my buck with nutrients. I love this juice because of its simplicity. 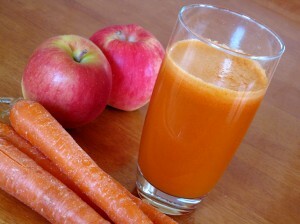 Apples and carrots are so full of nutrients and offer the perfect amount of sweetness. With a high potassium content to support cardiovascular health and Vitamin A to support eye, skin and bone health, you’ll want to whip up this easy and delicious juice today. Instructions: Press through a juicer, pour into your favorite glass and enjoy!